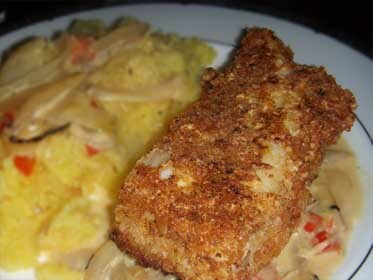 This is an easy recipe for frying either Haddock or any other type of fish. Thanks to the Panko, there was ablsolutely no greasy taste at all. The fish was moist, and the Panko crust made for a nice crunch. Saute' the Onion in a little vegetable oil over med heat. Try not to brown it like I did. 2. Add the Red Bell Pepper, and the wine. Reduce the wine until it's about 1/4 of it's volume. Add the orange juice and reduce again, until it begins to thicken up. Add the Heavy Whipping Cream, remove from the heat, and let it sit until you're finished with the Haddock. 3. Prep the Haddock by removing any skin, rinsing under cold water, then drying it. Mix the ingredients for the Breading Mixture in a bowl. Whisk the Egg White in a separate bowl. 4. Dip the Haddock first, into the flour, dust off, then into the egg whites, and finally into the Bread Crumb Mixture. Be sure to coat the Haddock real well with the breading mixture. Set the Haddock on a pate to dry a little while the oil heats up. 5. Heat about 1/4" of oil in a pan large enough to hold the breaded Haddock to about 350 degrees. I test the oil, by placing a little of the Breading Mixture in it. Fry the Haddock about 3 minutes on the first side, and about 2 minutes on the second side. Drain on Paper towels. Total cooking time is directly related to the thickness of whatever your frying, and the exact temperature op the oil, and how fast it'll recover from placing the cold Haddock in it. Your cooking time may vary slightly. Cook this fish until it's just barely done, and remains moist.